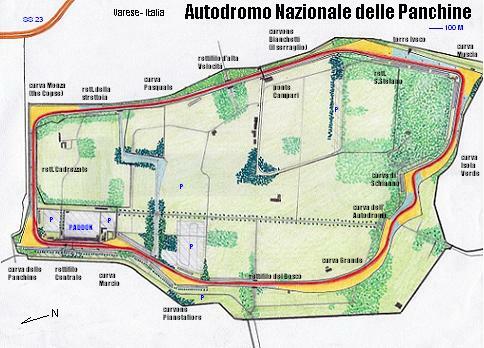 The Autodromo Nazionale delle Panchine is located in the outskirts of Varese. Built on the hills of a big park, the Autodromo delle Panchine is a high speed track that can be divided into two long accelerations connected by two lower speed sections. A lap starts on the Rettifilo Centrale where before Curva delle Panchine you can reach a very high speed. 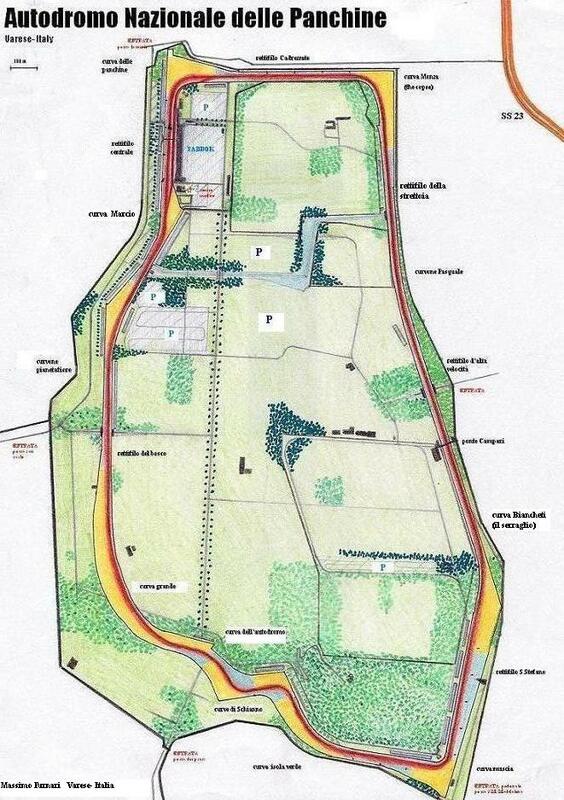 The first turn, on the right, brings you on the ascent of Rettifilo Cadrezzate then another right turn on the top of the hill for Curva Monza with increasing radius launches you on the no-breath descent through the fastest section of the entire track. After the first straight, Rettifilo della Strettoia, you dive into the first high speed corner at Curva Pasquale with full throttle. Now another long straight with increasing descent at Rettifilo d� alta velocit�, brings you in the most adrenalinic section of the track: the Curvone del Serraglio, a blind right turn, with another increasing of pendence, take your breath off and launch you at maximum speed on the last straight of Rettifilo S.Stefano. Now you have to brake very hard to run into Curva Muscia, a right corner that brings you another time on a small hill. After a short straight you have to accellerate hard into Curva Isola Verde, with the first part in ascent and the second part into a new descent. Brake for the slower part of the track, descent into a left blind corner for the first Schianno bend, then another time on the right for the second Schianno bend. From this point is a long ascent till Rettifilo Centrale and the start/finish line.